Nurmagomedov maintained his undefeated record at UFC 219 in Las Vegas on Saturday night. KHABIB NURMAGOMEDOV’S VICTORY on Saturday night clearly got Conor McGregor’s attention, but the Dubliner is adamant that the undefeated Russian’s performance at UFC 219 wasn’t as impressive as has been portrayed. Nurmagomedov took his professional record to 25-0 by mauling Edson Barboza over three rounds en route to a unanimous-decision win in the UFC’s lightweight division. 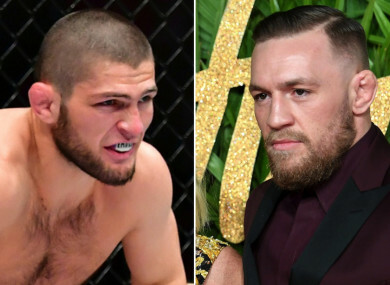 Speaking after the event on the FOX Sports broadcast, current welterweight champion Tyron Woodley and former lightweight title challenger Kenny Florian both admitted that they’d fancy Nurmagomedov to get the better of McGregor if the pair shared the octagon. But if the 29-year-old Dagestani is keen on a lucrative bout against the reigning lightweight champion, he’ll probably need to be patient. McGregor is now 14 months into a self-imposed hiatus from mixed martial arts, which seemingly won’t end until he’s granted an ownership share in the UFC or some sort of co-promoter status with the organisation. Furthermore, if McGregor does return, Nurmagomedov isn’t at the head of the queue to welcome him back. As UFC president Dana White suggested last week — and Dana is always true to his word! — the only fight that will mark the Irish star’s comeback is a unification bout with Tony Ferguson, who’s currently the lightweight division’s interim champion. Nevertheless, that hasn’t prevented McGregor from getting into it on social media with Nurmagomedov, who boasted in his post-fight press conference after Saturday’s win over Barboza that he’d happily face both Ferguson and McGregor in the same night. McGregor took to Twitter yesterday to offer his own assessment of Nurmagomedov’s performance, as well as pointing out that as soon as his financial demands are met, he’ll be back in action for the first time since his boxing defeat to Floyd Mayweather in August. Nurmagomedov eventually replied to McGregor’s taunt with a photoshopped image of his own, a reference to a video which emerged a few years ago of a young Khabib wrestling a small bear while growing up in his native Dagestan. If this particular rivalry eventually leads to a clash in the octagon, the only guarantee is that the fight itself will at least be more entertaining than the trash talk. But anything in the meantime that increases the possibility of this bout taking place can only be welcomed by fans, who are eager to witness what will transpire from a meeting of two of the UFC’s best — but with very contrasting styles. Email “Conor McGregor and 'dog s**t' Khabib Nurmagomedov trade verbal blows ”. Feedback on “Conor McGregor and 'dog s**t' Khabib Nurmagomedov trade verbal blows ”.